I almost never eat processed foods. I’ve decided to do that solely for health purposes. But one of the things I will get from time to time, even though it’s processed, is yoghurt (or sweet chili sauce. delicious.). Sometimes it’s just really nice. I only eat this breakfast occasionally. Partly because it’s processed, but also because it takes some time to layer it perfectly. I’m a perfectionist, and it can take me up to 15 minutes… It’s worth it, though. Yoghurt can be healthy. But the one I get has a lot of added sugar, which is not really healthy. You can use another kind to boost the health content, if you’d like, but I just make up for it with a nutrient dense chia pudding and some fresh fruit. And sugar doesn’t hurt if you only eat it once in a while. I use the Alpro Go On yoghurt containers. Disclaimer: I am not sponsored by Alpro. They’re just the perfect serving size, and taste pretty good. Not going to lie, I haven’t actually had any other vegan yoghurt. Because, sadly, Alpro is the only yoghurt brand in my area. I’ve seen many other vegan yoghurts on YouTube, that I would love to try, but I guess I have to wait until the Danish supermarkets expand their vegan options. 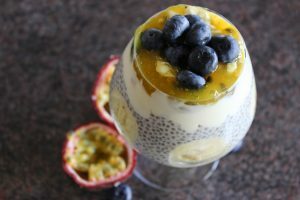 What truly makes this parfait wonderful, is the chia seeds. I love them! And I actually did a whole blog post on why. You can check out why I eat chia seeds every day. I never get tired of chia pudding. And of course, to make this parfait even sweeter, and better, I put banana slices in between the layers. Doesn’t this dreamy breakfast have it all? One of the biggest concerns about veganism, is not getting enough calcium. Chia seeds are a great source of that, but if your non-dairy milk is fortified, this baby will help you get even more calcium. I hope you try it, if you do then keep in mind that it will require patience to layer the parfait beautifully in a glass, but if you’re one of those people who couldn’t care less about how their food looks, you could just throw it all together in a bowl, and then this breakfast would be pretty quick (don’t show a picture of it to me, though, because my inner perfectionist would probably freak). A nice indulgent for either breakfast or dessert, delicious vegan yoghurt parfait paired with the always amazing chia pudding. 1. 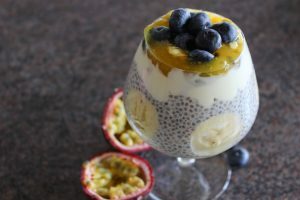 The night before, mix together the non-dairy milk, chia seeds, maple syrup and vanilla powder in a jar or an airtight container, and let the mixture sit in the fridge overnight to make a plain chia pudding. I would recommend stirring it a few times before going to sleep, if possible. 2. In the morning, take out the chia pudding. If it’s still too liquidy, add more chia seeds and let it sit for 10-15 minutes. Find all the ingredients for the parfait. 3. For layering, start by placing half of the yoghurt in the bottom of a glass. Next, add a few banana slices on top. You can also place banana slices on the side of the glass, if you’d like. Now add the chia pudding, and more banana slices on top of that. Finish the parfait off with the rest of the yoghurt, and the fruit part of the Alpro Go On container if you’re using that. 4. Top with anything you’d like, and enjoy! *if you’re using a yoghurt without any fruit part, I would recommend adding some jam on top of the parfait to give more flavour.